What a great first week of the Tour de Terry it’s been. Shortly after Tour Manager Simon Peyton and I arrived in Berwick upon Tweed on Sunday, Anne Forbes, Manager of King James Court, my first Anchor location en route, invited us on a guided tour of the town’s defensive walls. We established during the tour that we had a shared history: Anne's great grandfather, Piper Daniel Laidlaw, was presented with the Victoria Cross for continuing to play despite gas bombs dropping around him at the battle of Loos during WWI. My grandfather died in the battle and is buried in Loos. We were both surprised by this coincidence. It was a misty start leaving Berwick on Monday morning after a wonderful send off from King James Court, including a bagpiper. 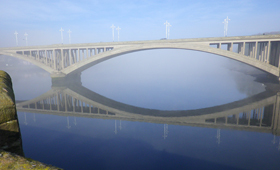 The River Tweed was perfectly still as the photo of the bridge shows. I decided to take the back roads rather than the A1 and rode through some beautiful countryside. I had a great reception at Church Lane: cream teas, two quizzes, a live accordion player followed by a fish and chip supper. No sooner had I arrived at Highmoor Court in Newcastle on Tuesday, I was whisked off my feet to do a photoshoot with the tenants for the Newcastle Chronicle and I did my first radio interview for Sun FM. After that I enjoyed meeting lots of other Anchor customers at Highmoor Court’s welcome party. Wednesday was a wonderful day. I was truly overcome by the welcomes I received from the older people at Cranlea who sang “Terry Baby” to Frankie Valli and the Four Seasons’ “Sherry Baby” as I left. And what a welcome I received from Manager Ellen Swanston and tenants at St Margarets Court along with the cadets and schoolchildren who lined the drive way as I arrived. Very moving. A singer and ventriloquist entertained us all at their party. 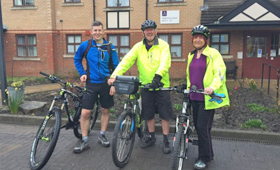 And it was great to be joined by fellow cycling fans Rob Martin, Anchor’s Head of Quality Care, and Caroline Bavin, who is the Scheme Manager at Shafto Court. It was lovely having them as company as I rode south to Sunderland. It was hard work getting out of Newcastle on Thursday due to bumper to bumper traffic which proved a bit nerve-racking so I arrived an hour later than planned at Cumbria Lodge, but what a welcome! As it was St Patrick’s Day, I went over to the pub opposite after the party for a pint Guinness to celebrate but at least the ride wasn’t as long as Thursday’s. Great welcome parties at both properties.